Ice cream is widespread and well-executed throughout the Inland Northwest. Sure, the sugary confection is beloved worldwide, but Montana and the surrounding region particularly hold the confection in high esteem. Here are the 10 best ice cream parlors in the state! For over two decades, this nationally-known, Montana-based ivory tower to ice cream has won awards and pleased masses and critics alike. And like anything worthwhile, Dipper serves the best by approaching things simply, perfectly executed. The cones and sundaes please families, discerning children and nostalgic old-timers all, and the range of flavors keeps the pickiest foodies on their toes. Bubblegum, salted caramel and coconut are especially enticing. The house-made, creamy delicacies here are hard to beat, Montana or anywhere. The retro diner-meets-drive-in signage exudes the unpretentious and borderline-gluttonous food service of nostalgic rural openness. Put simply: it’s friendly and urges to please. Here, any variety of ice cream or dessert is soul-satisfying. But regional, uber-Montanan specialties, including anything huckleberry, are the highlight. Relatively new to the scene, this hip upstart melds solid technique and youthful enthusiasm: mastering the basics and slinging serious classics, while being forward-thinking and tongue-in-cheek. The marketing and menu dragnet for Sweet Cream’s flagship store in Missoula has amalgamated the tastes and styles of the younger, foodie and university crowd. The menu is hip, fun and never boring. With 15 or so rotating, house-made flavors, this Montana-made ice cream shop perfectly toes the line between satisfying nostalgia and pushing the envelope. Another tendril of the sweet Montana staple, Big Dipper in Helena lives up to the hype. Home to Carroll College and a branch of the University of Montana, the capital city’s youthful vibe has both bolstered the ice cream business and helped it evolve. Classic shakes and sundaes provide the foundation for more adventurous flavors and seasonal specials. One’s sweet tooth may never recover. Along the incomparable Flathead Lake and home to the Whitefish Ski Resort, this Sweet Peaks location could simply rest on the laurels of stunning natural beauty. Instead, this shop makes the most of its surroundings to bolster and market its supremely local, and supremely delicious, creamery. As such, go with the natural flow and reap the seasonal menu: the s’mores evokes the campfire, and the London Fog has welcome hints of Earl Grey tea. Coldstone produces some delicious, even hearty, confections, all cut and constructed upon the icy marble surfaces providing the store’s namesake. It’s all about customization here, with a plethora of toppings to be weaved into thick ice cream batter. The heavier, custardy ice cream is more decadent and extremely sweet, almost to a fault. Almost. The population of Plains hovers just above 1,000, and the seasonal fluxes create long stretches of solitude. But a sort of osmosis occurs in such stark circumstances. The universal longings for comfort and sustenance are distilled into the few outlets that actually exist. 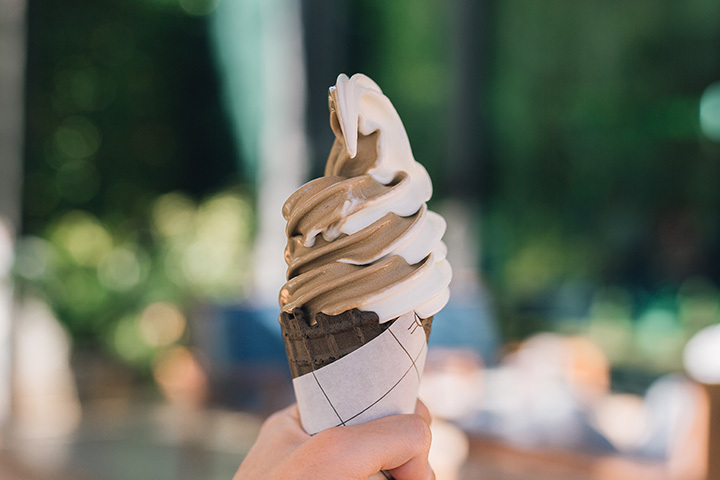 In other words, with little else to do, creative energies (in this case, ice cream) are concentrated, resulting in a labor of love often watered-down in communities of overstimulation. Ripples is that rare case in which the only option is in fact the best option.